Ulster boost their chances of having a home semi-final in the Pro12 by beating holders Leinster 26-10 in Belfast. 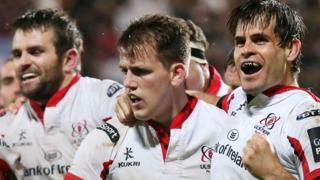 Lock Iain Henderson and winger Craig Gilroy scored Ulster's tries. Leinster had made a strong start with a Ben Te'o try helping them go 10-0 up but the defeat leaves them with virtually no hope of getting to the play-offs.